This technology is also referred to as Photo-rejuvenation, Photo-therapy bed is comprised of a light emitting over a particular wavelength, depending on what the desired results are. . Using technology developed by NASA and supported by over 40 years of independent scientific research it has now been concluded that there are many benefits gained from exposing the skin to intense red light (Photo Therapy). Red light is able to penetrate the skin to a depth of 8 – 10mm encouraging the cells to naturally stimulate the production of collagen and elastin. The anti-aging effect is produced by increased collagen adding volume to the skin and extra elastin firming and toning the skin. The obvious benefits of this new treatment is that it is totally pain free and is a SAFE method for naturally increasing the body’s own production of collagen. Increasing Collagen has always been acknowledged as beneficial for firming and toning the skin. Red Light Collagen Therapy achieves this without the need for painful needles. The skins natural elasticity reduces with age, eventually resulting in visible wrinkles as the skin is not able to pull itself taut anymore. 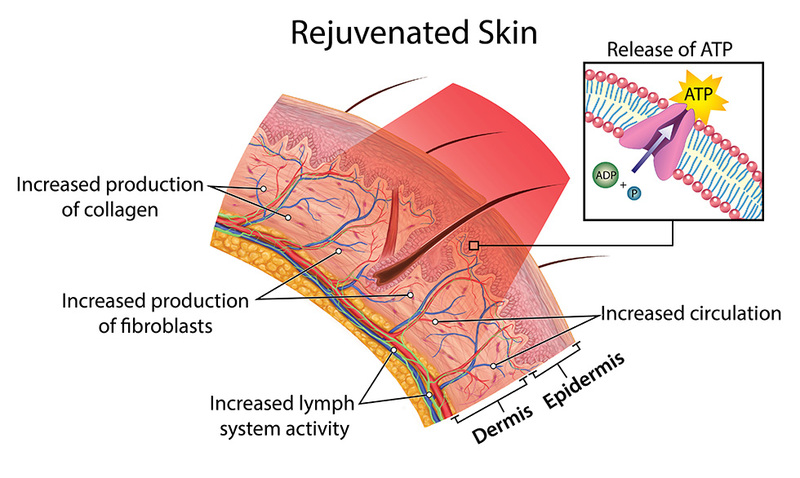 Also, as the body ages the production of new skin cells slows down. With fewer new cells being produced, skin begins to have more of an aged look. The combination of increased levels of both elastin and collagen are said to reduce this effect significantly. As well as producing elastin and collagen, red light therapy also increases circulation. It does this by relaxing the blood vessels in the treated areas allowing the blood to flow more easily. This further helps to prevent and get rid of wrinkles as increased circulation encourages the production of new skin cells. Aside from its cosmetic and anti-aging benefits, RED light therapy can provide relief from chronic and acute pain including muscle pain, joint pain, arthritis, high blood pressure, tissue and nerve damage, as well as reducing injury healing time. RED light penetrates below the surface of the skin, speeding up the healing process. RED light also stimulates the production of ATP, our bodies own natural source of energy (which depletes as we age) in turn increasing blood circulation and reducing swelling and inflammation. Red light therapy is a new treatment system that is gaining a significant following both in the beauty and sports healing communities. New benefits seem to be discovered everyday. Red light therapy is now being used by physical therapists, chiropractors, and other medical professionals to treat a multitude of sports injuries.